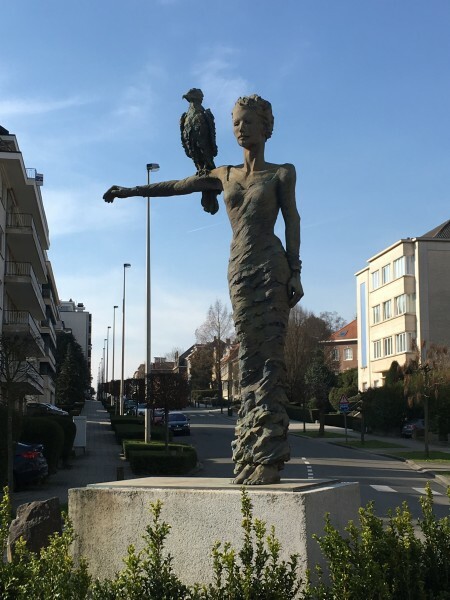 I had a rare Sunday excursion into Brussels this morning, to meet a friend from out of town who was visiting his sister in Woluwe-Saint-Pierre; and my eye was caught by the striking sculptures erected on street corners in the area as I navigated the last few turns. My friend agreed to go for a brisk walk around the neighbourhood, and we both snapped away on our phones. 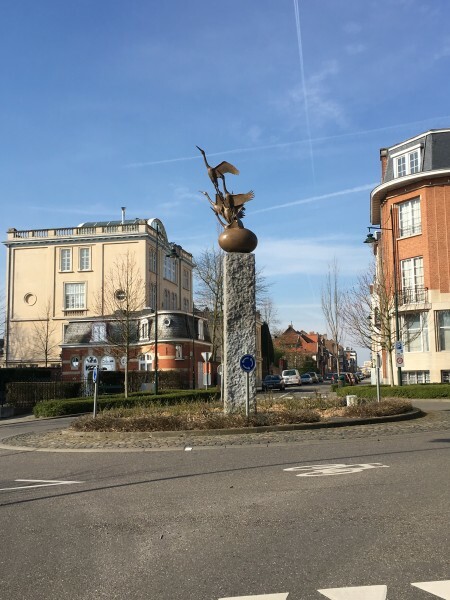 The Woluwe-Saint-Pierre commune, God bless them, have published a guide to their sculptures which I have cribbed from below. This lady celebrates the morning. (It was a cold morning this morning.) She is a copy in Carrera marble by contemporary artist Patrick Crombé of an original plaster work by early 20th-century sculptor Arthur Dupagne (the original is apparently in the possession of the commune of Woluwe-Saint-Pierre). You'll find her on the corner of Avenue Jules César and Avenue de l'Horizon; she has been there since 2012. This is simply a Woman With Falcon, by contemporary sculptor Anne-Marie Morelle. She is at the intersection of Avenue des Volontaires, Avenue General de Longueville, Rue du Bemel and Avenue de l'Oiseau Bleu, facing east. She has also been there since 2012. 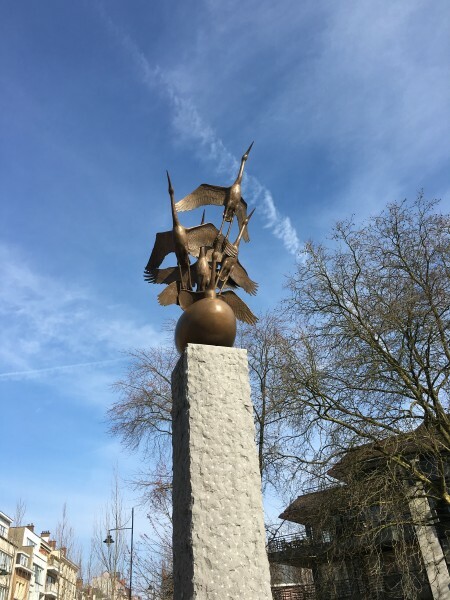 Continuing the bird theme, we have storks bursting from an egg; but the message is a grim one, because this is a memorial to the victims of the 1994 genocide in Rwanda. It is a collaboration between Belgian artist Tom Frantzen and Rwandan artist Epaphrodite Binamungu. Since 2004 it has been at the intersection of Avenue Roger Vandendriessche, Avenue Jules César and Rue Père Eudore Devroye, and remains controversial. A much more venerable piece, Les Fiançailles (The Engagement/Proposal/Betrothal) sits at the intersection of Avenue General de Longueville and Avenue Jules César. He has popped the question and she is answering. (I'm not entirely convinced that she is saying yes.) 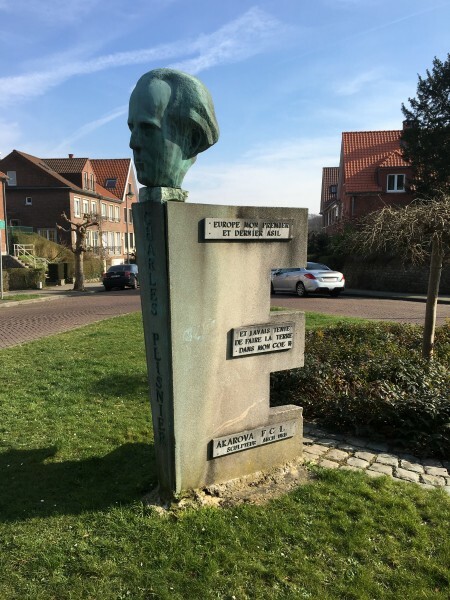 It was apparently designed by early twentieth-century artist Henriëtte Calais, who lived nearby, but constructed only after her death by Charles Verhasselt and inaugurated in 1962 (moved here in 1966). We approached this high thin obelisk from behind, down Avenue Jules César to its intersection with Avenue de l'Atlantique, and were mystified about its significance. 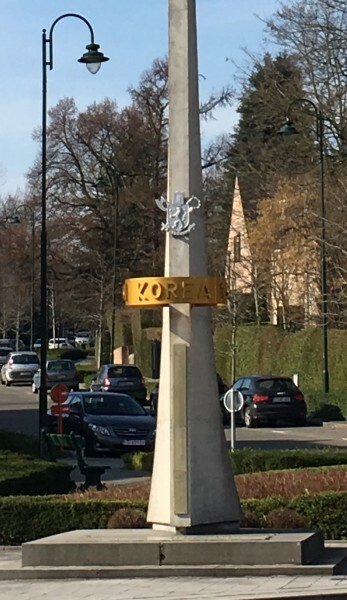 But when we got around to the front it became clear: this is the monument to the Belgian volunteers who were killed fighting for the UN in the Korean War between 1951 and 1955. It is by Xavier de Crombrugge, and has been there since 1966. 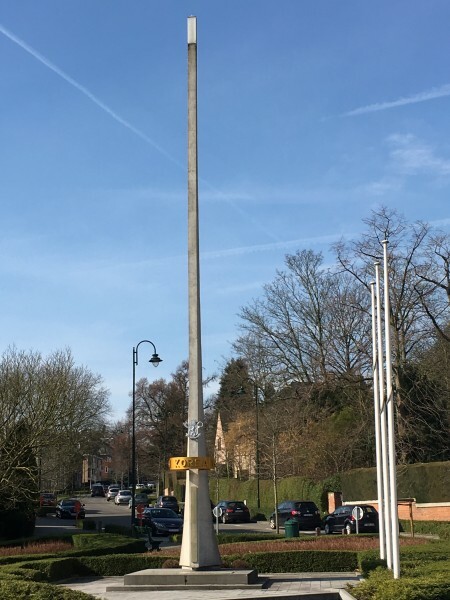 This isn't strictly in Woluwe-Saint-Pierre - it's across the communal boundary in Etterbeek - but I passed it on my way home at the intersections of Avenue Boileau, Avenue Edmond Mesens and Avenue Nestor Plissart, and felt it fitted more or less with the theme of the morning. 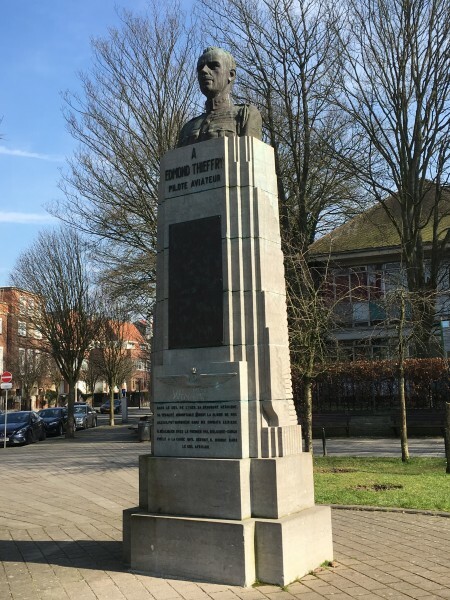 It commemorates the Belgian aviator Edmond Thieffry (incidentally answering my question about who the metro station was named after), a First World War ace who tried in vain to set up a regular air service between Belgium and the Congo, and was killed in a plane crash in Tanganyika in 1929, aged 36. 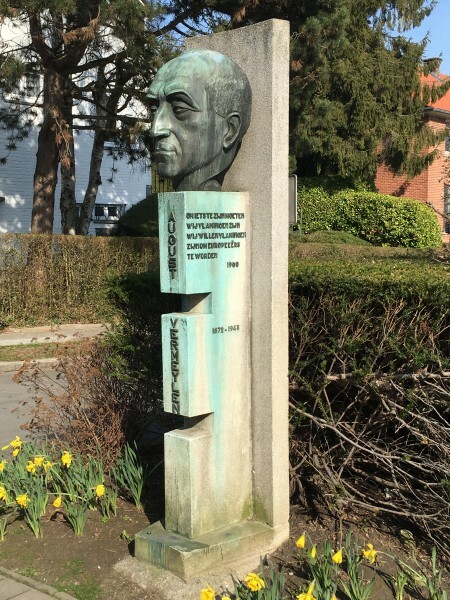 The monument was erected in 1932. Etterbeek is less detailed in its records than Woluwe-Saint-Pierre and I wasn't easily able to identify the artist. Given Belgium's difficulties about its colonial past, Etterbeek may prefer to let this one sink into obscurity. And finally a couple of busts of writers by the same artist, Akarova (Marguerite Akarin). She was actually better known as a choreographer and dancer than as an artist and sculptor in her lifetime, but of course the art remains after the performances have faded from memory. 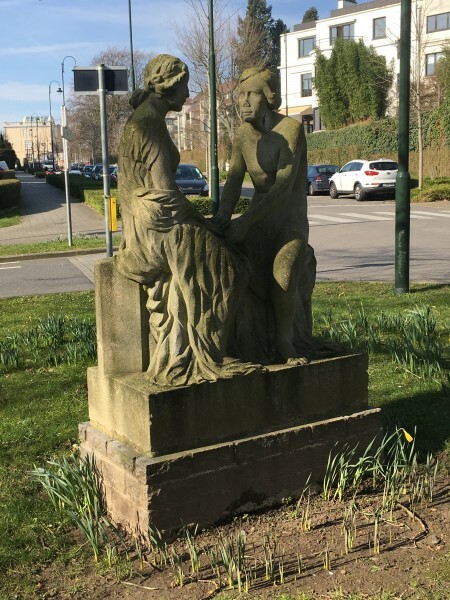 The two busts were both commissioned in 1957 by Etrimo, the construction company which created the European Quarter in Brussels. The first, at the junction of Avenue des Géraniums and Avenue des Camélias, is of Walloon activist Charles Plisnier; on the side is written in French, "Europe My First And Last Refuge" and below that "And I Tried To Create The Land In My Heart" (a bit ambiguous as to which "land" that actually is). At the other end of Avenue des Camélias where it intersects with Avenue des Frères Legrain, for balance, we have the Flemish writer August Vermeylen; the inscription says, "To Be Anything, We Must Be Flemings;. We Want To Be Flemings So That We Can Become Europeans." It was an interesting and thought-provoking reminder that for Belgian cultural nationalists, Walloon and Fleming, of the early twentieth century, European integration was a sine qua non to avoid disaster. That was just the result of a random Sunday wander around the streets. Who knows what we might have found if if we had actually planned an expedition? If I'm reading it correctly, the sculptor was César BATTAILLE. Thanks - useful to know!